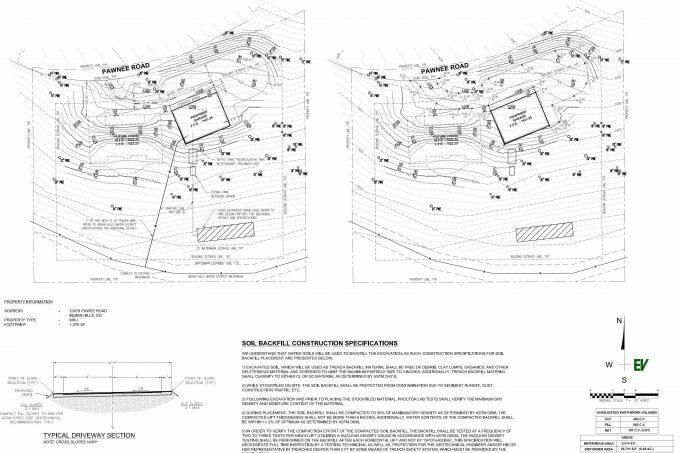 As I mentioned before, a mountain lot will most often drive the home design process. One thing that I firmly believe in is the coordination between the contractor, owner, architect, and engineer; every piece is essential, and without input from each group, it typically leads to an inefficient and expensive home. Usually, people focus on the “site” aspect of their home after the house design, but the site design is a vital step. Being a civil engineer and builder, I knew access and constructability were two of the most critical pieces of my build. Mountain lots have a variety of site hurdles, before buying any lot my number one recommendation is to get a topographical and boundary survey of the site. A typical simple lot survey should be around $3000, but lot size, tree cover, etc. will all affect this. Most mountain counties require review and approval of each home plan by the fire department. 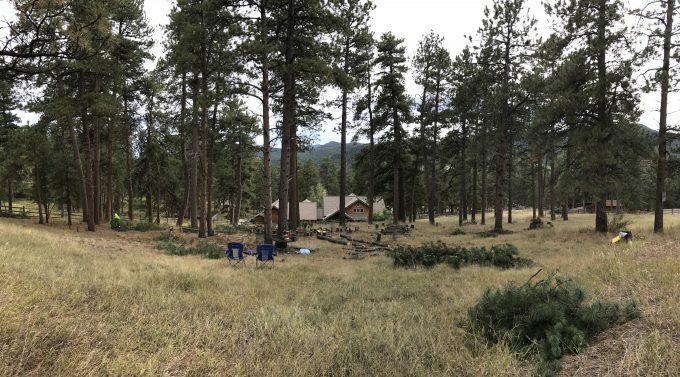 The department looks at each home differently and analyzes the response time, tree removal, access, and other components to determine what they will require to be implemented before approving a plan. 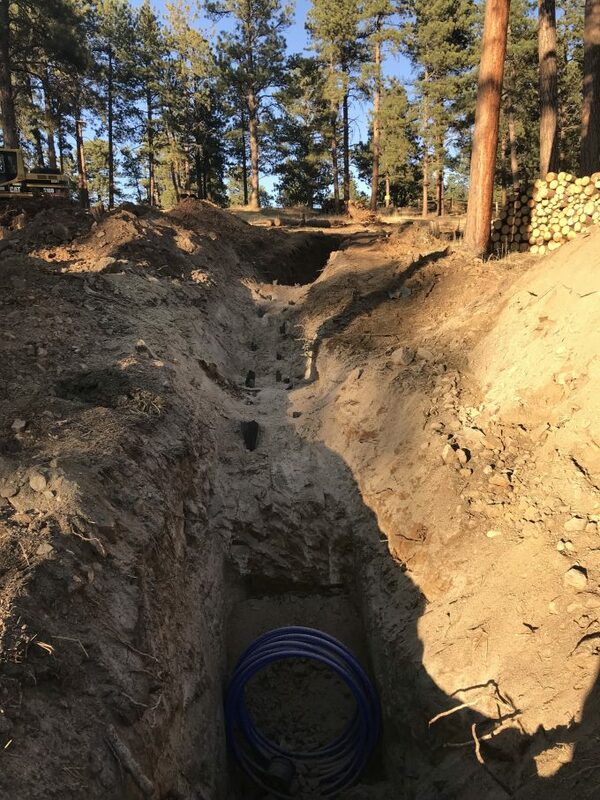 This can include large turnarounds, wide car pull-off areas, underground tanks, sprinkler systems and others which are often dependent on the number of homes that are served by a driveway and the length of the driveway to the home. Fire and county review will also require driveway curves of at least 30’ in radius, grade maximums around 10% (I always tell people to use a 10’ drop over 100’ as their example), and widths between 14 and 16’. In addition to this, people often need larger areas for bigger vehicles, access to multiple garage doors, etc. This is usually our biggest challenge because of the cost that each additional foot of driveway can cost. Nearly every mountain home has a retaining wall or exposed rock slope. This is due to the average lot grade between 20 and 40%. With average house depths between 36 and 46 feet, most sites need to correct for around 12’+ of grade difference across the home (for the average home) by adding walls or blasting and hammering bedrock. Once yards, driveways, and other features are added, they can start increasing the amount of wall quickly and significantly. Driving around our neighborhood you will notice a lot of steep driveways, peculiar house orientation, and you’ll see a lot of garage doors and pavement facing the street. There is always a delicate balance in home design, people often like to have grand entrances and garages that don’t block the views and access to the front door, but these require large footprints which don’t fit the mountain terrain. This stuff doesn’t sound very exciting, but no one likes to spend hundreds of thousands of dollars on moving dirt. Generally, the number one request we get is that “We want it to meet the standards, get us in and out of our garage, but not cost a lot” and that’s what we try to do! When I first designed the home footprint and layout, I knew that we would be building a detached 3-stall, extra deep garage that would function as a mother-in-law suite with slight separation from the home. We also knew that we wanted guests to see the views as they approached and didn’t want the typical “front door” to be the focal point of the home. The spectacular mountain view needs to be the eye-catcher. As I placed the home in the ideal location for great circulation and function, staked the garage and home corners, and looked at my lot impact, I immediately knew I had to go back to the drawing board and make some sacrifices. We had a beautiful band of trees stretching through the center of our lot pushing the home toward the road, it was a bit tight for vehicles but not worth removing five large 30”+ pines, so I was able to limit the driveway circulation but is well worth it in the end. I can’t help but think of how others would be impacted if the contractor didn’t acknowledge this type of issue, communicate the problem to the owner, got the engineer on site to see the potential problem, and redesigned to accommodate the real world. Luckily for me, I played all of those roles and thus caught it in time. We also wanted to limit the driveway length to allow us not to be required to have a full fire turn-around but needed enough room to be able to maneuver a 30+ foot trailer through the lot. It’s tight, but we made it! Our lot was more forgiving than most, with approximately 20% slopes we were able to drop existing grade across the garage by utilizing 4’ of exposed foundation and were able to create a walk-out basement that fit the terrain as well. Once again, a forgiving lot (and adequate lot research) saved us significant cost as we started our driveway construction, tree removal, and home layout. We closed on the property and started the permitting process with the county immediately, the fun continues. Click below to catch-up on Brian’s earlier posts for this series.